After a hard run workout this morning I needed to get a bigger breakfast than normal. There were some already thinly sliced potatoes in the fridge and I was feeling like eggs. Sounds like a pretty good combination! Knowing that eggs and potatoes in combination have one of the highest biological values (proportion of absorbed protein). Heat the olive oil in a mid-size skillet and gently fry the potatoes from both sides. I carefully placed the on the pan so they are not overlapping and can cook properly. Turning the slices is not the easiest thing to to but you will manage :). 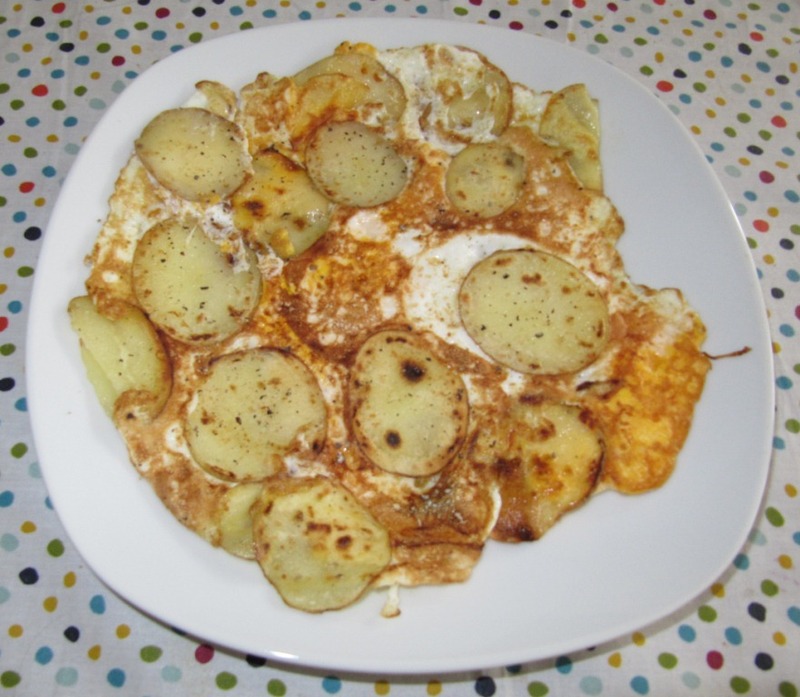 One the potatoes are done, add the two eggs over them, add sea-salt and again cook from both sides. Depending on you liking you can season the omelet/pancake with black pepper etc. Here is your quick and nutritious breakfast, would work great as a quick dinner as well. You could add a salad to the dinner portion.